Since I made the really nice fish stock the other day, I got some seafood and made a quick paella with "Kamado-san" (double-lid donabe rice cooker). Instead of infusing the saffron with the stock, I simply sauteed a pinch of saffron with the onion and garlic (with the olive oil). Then, added the yellow bell pepper, and brown rice to saute further before adding the fish stock, chopped tomato, salt and pepper. 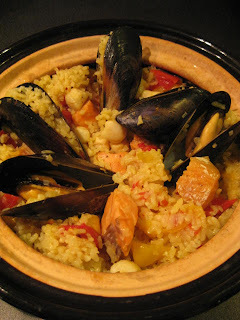 I stirred ingredients, and topped them with the salmon, scallops, and mussels. 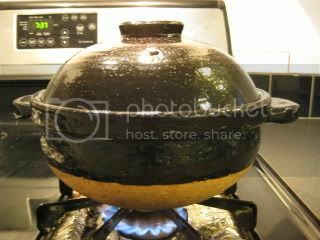 Closed both innner and top lids, and I cooked it over medium-high heat for 12 minutes. The rice came out so gorgeous!! With a little squeeze of lemon, the flavor was so bright and nice. Also, with the steam effect of Kamado-san, all the seafood were so juicy and cooked perfectly. You can find the full recipe on toiro's website. So, please check it out. 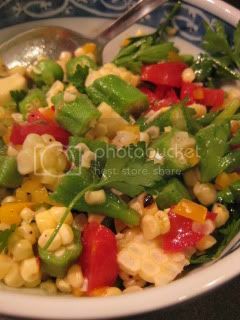 As a side dish, I made a simple summer salad with the grilled corn, herloom tomatoes, okra, and parsley. I love summer colorful dishes.